Have you noticed a drop in your fuel economy? Is your car having a tough time getting up to speed? Are you in between scheduled maintenance services? It sounds like it's time for a tune up. While keeping up with factory services will help ensure that your car continues to run at maximum efficiency, sometimes, particularly with higher mileage cars, a little extra maintenance is necessary. This is often referred to as a tune up. The term tune up is derived from actually tuning a carburetor, a part of the fuel system on older vehicles, which is something not used on modern cars and trucks. However, the term remains, a reminder of our past and that sometimes cars need a little help to run right. 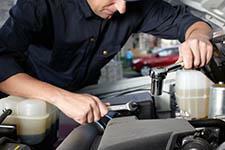 During a tune up, which is often conducted when a vehicle is getting lower gas mileage, having trouble starting or running or is experiencing other minor issues, a technician will perform one or more small maintenance services that are designed to restore performance. There are numerous services that can be done to help get a car back up to speed, including the following common services. Spark Plugs - Replacing the spark plugs and spark plug wires will ensure that your car is running on all cylinders. As the miles add up spark plugs can become corroded, causing them to misfire, which reduces power and wastes fuel. Fuel Filter - A clogged fuel filter can prevent the proper amount of gas from getting to the combustion chamber. This is a simple and quick fix on most cars and trucks. Air Filter - The air filter removes airborne contaminants, such as dirt and dust, from the incoming oxygen that is mixed with gas in the combustion chamber. If the air filter is too dirty it can prevent air from passing, resulting in a vehicle that runs rich, meaning it's burning excessive gasoline. Fuel Injection Cleaning - A gummed up fuel injection port can prevent fuel from entering the combustion chamber as necessary. Using special solvents the injection units can be cleaned, allowing for a full stream of fuel. When your car isn't running right it is important to visit a trusted auto repair shop to ensure that the issue doesn't get worse. If it is time for a tune up in Palo Alto or Mountain View, head to The Car Doctor. Our team of expert auto maintenance technicians will return your car to top notch shape! Call The Car Doctor at (650) 492-6853 to schedule professional auto maintenance in Palo Alto today!